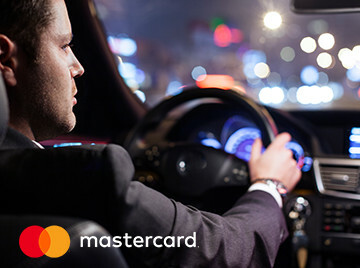 As a valued Mastercard® Cardholder, benefit from up to 10% discount of best available rates at participating Hertz locations worldwide. Free one car class upgrade at participating locations (subject to availability). Earn 500 Gold Plus Rewards bonus points upon enrolment. Faster returns with Hertz Instant Return. Bypass the queues and the counters at more than 50 of the world's busiest airports. Expedited Gold service at over 1,000 locations worldwide. To receive the benefits associated with Hertz Gold Plus Rewards® membership, your Gold membership number must be quoted at the time of reservation. Up to 10% off best available retail rates will be displayed when the Mastercard Cardholder enters their Gold Plus Rewards membership or relevant CDP associated. Discount on best available published Retail rates (excluding Special Offers) at time of booking. Discount applies to time, mileage and all mandatory insurance and waivers that may be included in the base rate charge. When booking, pre-paid rates are quoted in home currencies (e.g. Sterling when booking from UK), non-prepaid rates will be quoted in the local currency. All rentals outside of EMEA must be pre-booked in Europe prior to departure. Renters must meet all Hertz qualifications, standards and requirements as per the terms and conditions of Hertz rental agreements. Visit the Hertz website at www.hertz-europe.com for full details. Leisure minimum rental age is 23 years. Delivery or collection is not available. Rates fluctuate throughout the year based on supply or demand. Refunds are not available for ‘no shows’. When picking up the car, the authorised renter must have a valid credit card and driving license. The vehicle must only be driven by the renter or another individual who has been authorised by Hertz and added to the Rental Record. Applicable to Hertz Family, Fun, Green and Prestige Collections at participating locations worldwide. Minimum rental age for Hertz Prestige Collection vehicles in Europe is 30 (exceptions may apply). A Mastercard credit card needs must be presented during reservation and for payment. A second credit card may be required for verification purpose. A clean (where applicable) and valid driving license held for at least 1 year. Collections are only available at participating locations. All vehicle and models are limited, subject to availability and subject to change without notice. Vehicles must be returned to location of rental, if not a one-way charge will be applied if returned to a different location, for details please check at location during vehicle pick-up. Other conditions may apply, please see the specific Rental Qualifications and Requirements for each country for full details. This is subject to availability and available at participating locations except for South Africa and Greece. In the USA, the upgrade will only be valid for non-prepaid rentals. Complimentary one-car-class upgrade is available through and online printable voucher (downloaded on Hertz-Mastercard Micro site) and to be surrendered at time of rental to redeem upgrade. One car-class upgrade does not apply to Hertz Collections (Green, Fun, Prestige and Family). Free upgrade is valid for rentals of a maximum of 21 days at participating locations in Middle East. Only one voucher can be used against any rental. Mastercard cardholders are allowed to accept and use this offer as many times as they want during the validity period.